Everyone who’s anyone in the Ford Mustang scene knows full well the nostalgic and classic feel a set of rear window louvers provides for most any year of Mustang. New on the aftermarket this week is a set of rear window louvers crafted to fit all S197 Mustangs to date (model years 2005 – 2012). MRT is very excited to get this product out there and on the street ahead of the winter-time cruises and holiday season, to make sure every aftermarket junkie has a chance to get their hands on a quality-crafted, all-aluminum, and seamless constructed Mustang rear window louver kit. What’s more, this MRT rear window louver setup requires no drilling or modifications otherwise, for true OEM fitment. Of course, the hardware required, installation instructions, and MRT’s phone number are at the ready to get the project done in rapid fashion. Keep reading to get the skinny from the MRT PR, following. 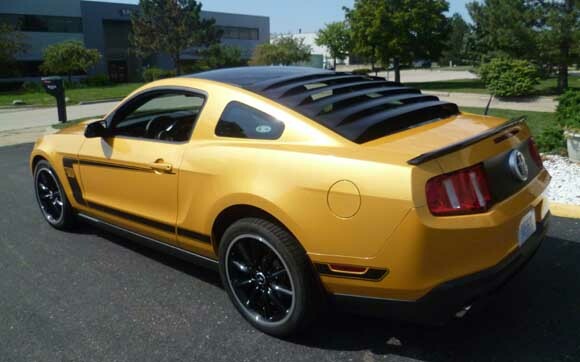 Plymouth, Michigan- MRT is pleased to announce their new rear window louvers for 2005-2012 Mustangs including the new 2012 Boss 302. Louvers have always been popular with Boss 302 owners, in 1969 and 1970 over 50% of all Boss 302s were delivered with louvers. The new louvers complete the look of the new Boss 302 and all 2005-12 Mustangs without compromising rear window visibility. The MRT rear window louvers are engineered so that each slat produces a tight flowing look with an arc that compliments the rear window. Every slat has a smooth, seamless surface eliminating the need for unsightly rivets and hardware. The MRT louver features a patented one-piece, aircraft grade aluminum design that is lightweight and durable. MRT offers its rear window louvers powder-coated satin black and ready to install; they also can be painted to the owners taste. The louvers are hinged for an easy lift and the standard MRT prop rod makes cleaning a one person job. The MRT rear window louver does not require sheet metal drilling or modifications during installation. The hardware kit and instructions are included with the rear window louvers. MRT rear window louvers are 100% engineered and manufactured by MRT in America. MRT, headquartered in Plymouth Michigan is a performance aftermarket engineering, customization and sales company that specializes in automotive exhaust, styling and performance.